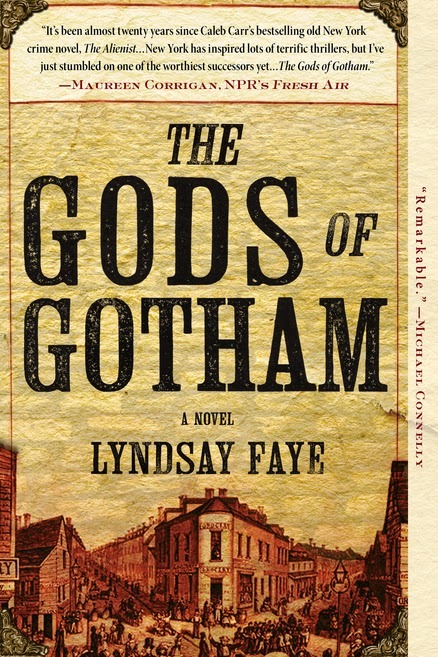 The Gods of Gotham (A Timothy Wilde Novel) and Seven for a Secret (A Timothy Wilde Novel) by Lyndsay Faye. Berkley Paperback 2013, Berkley Paperback 2014. Personal copies. The Plot: The Timothy Wilde novels are mysteries set in 1840s New York City, at the very start of New York City's police force. The Good: There are few things I like better than a historical mystery. Faye both recreates 1840s New York, full of details and interesting tidbits; yet also creates something that is a mirror to our own time. For example, the formation of the police force is far from simple. Part of it is need, with the growing size of the city and population. Then there is the mix of altruism and nepotism. Wilde, for example, gets a job on the new force not because he wants it or has any particular skill set -- he's a bartender. Rather, it's because of his politically connected brother. Timothy Wilde is reluctant to even take the job, because he and his brother don't get along but for various reasons he needs the job. And, it turns out being a bartender is a pretty good skill set: observation, talking, listening, crowd management. Oh, and another thing: many regular people were opposed to a formation of the police, in part because they feared it was militarization. So.... 1840s questions that have parallels today. The Gods of Gotham is the first in the series, and gives as much room to Timothy's own origin story as it does to the start of the police. He'd been left orphaned as a child, raised by his older brother, befriended by a local minister. Timothy isn't desperate enough to accept his brother's job until he loses everything in the Great New York Fire of 1845. And here is why I love fiction that accurately incorporates history: learning not just about fire but also the just how scary a fire was -- how it was fought -- and the devastating losses, both in terms of lives, injuries (Timothy's face is burnt, leaving scars), and property. Timothy's savings, all his property, is lost. And Faye's writing! I loved it. Here, an example of showing the bias of the times and where Timothy stands in terms of that prejudice: "Popery is widely considered to be a sick corruption of Christianity ruled by the Antichrist, the spread of which will quash the Second Coming like an ant. I don't bother responding to this brand of insanity for two reasons: idiots treasure their facts like newborns, and the entire topic makes my shoulders ache." 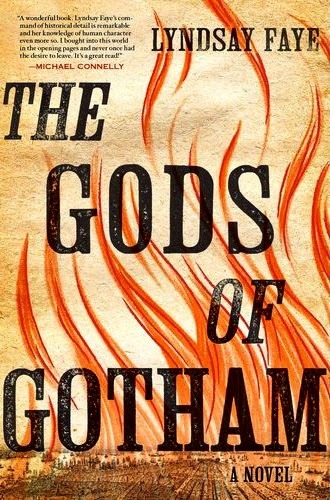 The Gods of Gotham, as that quote hints at, is about the immigration as a result of the Irish Potato Famine, how those Irish Catholics were treated in New York City, as well as missing children, prostitution, child prostitutes, private efforts at addressing the problems of poverty, women's rights, religion -- and, of course, the politics of the 1840s. And as I read it, I thought of all those historical fiction children's books, set in Ireland, set in other European countries, were the happy ending, the solution to poverty or discrimination, is emigration to America; and how often that was just the start of a new nightmare. In Seven for a Secret, Timothy Wilde is still with the New York City police force. How the police worked, what actually it meant to be a member, was fascinating -- Timothy's role as detective, investigating and solving crimes, is almost as revolutionary as the force itself. 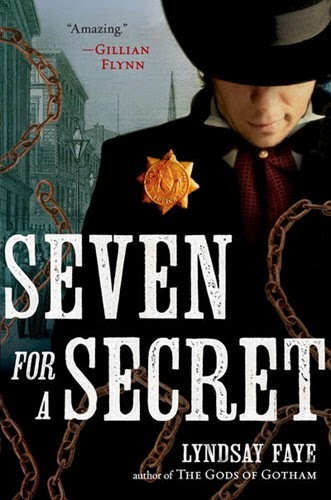 Seven for a Secret centers around a different group of New Yorkers than the one shown in the first book: the world of free blacks and runaway slaves. Without giving too much away -- don't worry. Timothy is not the Great White Hope that saves the day. The mystery involves that community, and so Timothy becomes involved, and at times he is ignorant of the laws and social mores and risks -- but the community itself has leaders, and Timothy works with them or for them. The African American characters are multifaceted and complex. My favorite quote from Seven for a Secret: "He likes who he is in the story because it's the wrong story he's telling." What else? I adore Timothy's older brother, Val. Yes, Timothy is often at odds with him; yes, Timothy is judgmental about Val's choices, from Val's politics to his substance abuse to his womanizing. But what captured me is that Val was a teen when his parents died; the two books show just how brutal and cold their world was, and just how indifferent it was to two orphaned boys. Timothy doesn't quite realize or appreciate just what Val did, was willing to do, to take care of him. Val, in some ways, has earned his right to drink or drug or romance too much. He's my 1840s Bad Boyfriend. Finally -- Timothy himself. He's in his mid-twenties, and while he's great at observations and putting the pieces of a puzzle together, he's not brilliant. He makes mistakes, mistakes that arise from his youth, his inexperience, his own biases (such as the ones he has about his brother), and his own stubbornness. Good news: a third book is on its way! The Fatal Flame is scheduled for May 2015. And yes -- these are some of my Favorite Books Read in 2014.